Even after following a strict maintenance programme you may find your lawn occasionally requires additional work or succumbs to pests or diseases. Here are the main issues you will face with your lawn. Thatch is a build-up of dead bits of grass on the surface of the soil and is quite natural in lawns that are getting old. The thatch prevents rain from soaking down to the grass roots and keeps moisture at the soil surface, encouraging moss. The thatch will build up faster if you don’t use a grass box on your mower. Rake it out regularly during Autumn as part of a regular lawn-care programme. Compaction also occurs on older lawns and is caused by standing garden furniture on it, or running heavy barrows over it or even just standing on it during wet weather. All this activity squashes the lawn down and plant roots find it harder to push through the hard ground. Spiking the soil with a fork alleviates compaction and, by making airways, helps the grass grow. Again it’s a job that’s best done in autumn. On clay soil follow the spiking by brushing gritty sand into the vertical drainage channels (about a bucketful per square metre), this makes it firmer to walk on, yet better drained in wet conditions. The rosette-forming, or broad-leaved, weeds, such as daisies, plantains and dandelions are easy to eradicate with selective lawn weed killers. You can either spot-treat individual weeds with a ready-to-use product or you can sprinkle a combined weed-and-feed treatment over the whole lawn. For small-leaved weeds you’ll need a liquid weed killer that is specially designed for this type of weed. Dilute it and water it on with a watering can. Dead weeds leave bald patches in the lawn that are quickly colonized by weed seeds and moss, so it is a good idea to feed at the same time as weeding; if the grass is growing well, there will be no room for weeds. Use lawn weed killers in late spring when weeds are growing fast, but before they start flowering. By the time they flower, weeds will have become too tough to respond well to treatment. Apply liquid lawn weed killer on a dry day, so that it has at least 12 to 24 hours to be taken in through the leaves. If it’s washed away too soon, it won’t have a chance to work. If you use a granular weed-and-feed treatment turn on the sprinkler, if it hasn’t rained after 48 hours, to make sure that the treatment is effective. Moss will continue to return if your lawn is in a damp, shady place so try to let in more light and improve the drainage. The cheapest, simplest method of controlling moss is to rake it out, it is hard work so you may want to invest in a powered lawnraker or hire one. An easier solution is to buy liquid lawn moss killer, or products that combine moss killer with lawn feed. You need to feed the lawn, so that it thickens up and fills gaps where moss has been, to stop weeds coming in. Apply in spring. Lawn sand is an effective preparation that acts as a fertilizer, weed killer and moss killer, but it can scorch the lawn if applied too heavily. Buy it ready-made or make it up yourself from 4 parts (by weight) sulphate of ammonia: 1 part sulphate of iron: and 20 parts fine silver sand. Apply, at the rate of 115g per 1sq.m (4oz per sq. yd), when dry during spring and early summer, but make sure the soil is moist. Once the moss turns black it is dead and can be raked out. Some bald patches on the lawn are due to constant use by regular heavy foot traffic, if this is the case you would be better off putting in a proper path. Some patches may be because the grass isn’t growing very well, and spiking and feeding may be all it needs. Other patches may simply be ‘scalped’ bumps; that happens when the mower skims off the top of higher areas of lawn. Levelling the lawn will correct this. If there are bald patches where large rosette weeds have been removed, or because the lawn in poor condition, the quickest way to deal with them is to reseed. Broken lawn edges look untidy, make mowing difficult and edging almost impossible. Take a sharp spade and cut out a square of turf that has the broken edge along one side. Turn it around and fit it back into the gap, so that the straight edge is around the outside of the lawn and the broken piece is on the inside. This leaves a hole in the lawn. Fill the hole with topsoil and firm it down then reseed it as if it were a bald patch. To flatten peaks strip the turf off the peak, remove some of the soil beneath and level the spot before putting the turf back. Hollows are treated in the same way, but in reverse. Remove the turf, add topsoil until the hollow is level and put the grass back. Worms are actually beneficial in the garden – they make hundreds of tiny drainage channels in the soil. They also drag organic matter, such as dead leaves, into the ground, helping with soil enrichment. However, some species of worm leave worm casts on the lawn’s surface (mainly in spring and autumn). When the weather is dry sweep the worm casts off the lawn with a stiff broom. Ants like nesting in dry soil in lawns in summer and they will defend their nests, often giving you nasty nips. Ants usually target lawns which are thin and have lots of bare soil, so keeping a good lawn will deter them. Soak new nesting sites thoroughly with water to drive ants away, if this doesn’t work don’t worry; the whole colony will fly away in late Summer. Moles burrow beneath lawns in search of earthworms. There are lots of ways you can try to get rid of moles but none of them are 100% successful and even if you do get rid of one it is highly likely that another will move into it’s place soon afterwards. As a final resort you can call in a mole catcher. If you accept the moles just remember to brush the molehill back into the hole to avoid bare batches and a sunken lawn. Leatherjackets are the larvae of the crane fly (daddy-long-legs) and they eat grass roots. The first thing you know about it is lots of little yellow patches, or flocks of starlings probing for grubs and there isn’t an awful lot you can do about it except repair the pecked-up surface after the birds have finished. Chafer grubs are the larvae of the chafer beetle which feed on the roots of grass weakening the roots and turning the grass yellow. The adults are between 9mm and 39mm long and emerge the end of May through to the end of July when they begin feeding on shrubs and trees before laying their eggs in your lawn. The larvae hatch about two weeks later and begin to feed on the grass roots. The grubs are white with light brown heads and three pairs of legs, their bodies are curved into a letter C shape. They continue to feed until the end of September when they bury themselves deeper into the soil to spend the winter months. 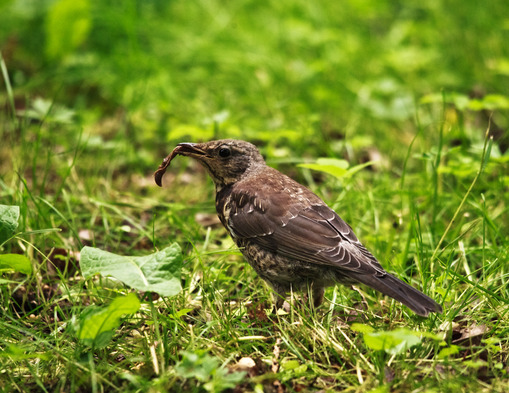 Usually the first sign that your lawn is infested is when you see birds or mammals ripping up the turf as they look for the grubs. Once you know you have the grubs you can treat with a Chafer Grub Killer but it is sometimes best to allow the birds and mammals to have their fill and deal with the damage later. I had trouble with my lawn maintenance due to it having such awkward edges. I wanted a sustainable edging that wasn’t as ‘twee’ as the log-roll stuff available, but not as flash or expensive as stainless steel. I found this recycled edging and it’s really good – durable and it can be shaped really easily http://best4garden.co.uk/ have the one I used.